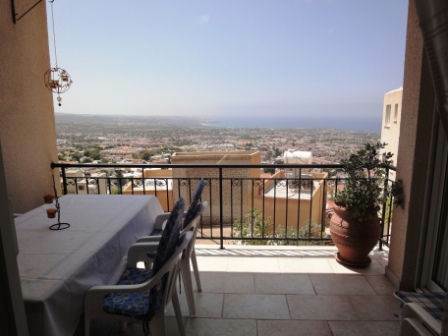 Cyprus Property Blog by Cleo : Peyia Property - New on the Market - Fantastic BUY! NOW SOLD! • 129 sq. m., 3 bath, 3 bdrm 3-level split "Terraced House" - €169,000 EUR - Title Deeds & Sea Views - NOW SOLD! Peyia, Paphos, Cyprus - This particularly spacious 3 bedroom terraced house is located in the traditional part of Peyia vlllage within easy walking distance to the local shops and amenities. Designed on 3 levels the accommodation is particularly spacious with good quality finishes, and the unobstructed sea views are absolutely stunning. A marble staircase leads up to a wonderful living space with an end kitchen, spacious lounge/dining area, and guest cloakroom. Patio doors lead on to a good size balcony with fantastic views. Upstairs there are three large bedrooms all with fitted wardrobes. The master and second bedroom have access to a balcony, again with fabulous views. There is an ensuite in the master bedroom, and a huge separate family bathroom with vanity unit off the landing. Additional accommodation at the lower entrance level features a large sitting room with access to the garden, a good size utility room and storage area. This level can easily be used as self contained accommodation with the sitting room as a 4th bedroom/studio, the utility room easily converted to a kitchen, and space to add a shower room. A covered veranda in the paved garden houses a superb hot tub/spa where you can relax and enjoy the lovely views. The closed in parking space can easily be made into a full garage with the addition of a door, and along the side wall are large storage cupboards. The property is being sold fully furnished with everything included, and with full title deeds and no communal fees, this property is a fantastic buy!